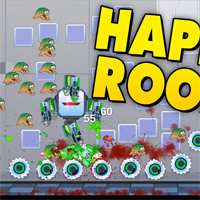 Turtle Run is a funny action game from Mausland. Mission of the game is to reach the ocean as fast as possible while you avoid the falling objects. Control the freshly hatched turtle with the arrow keys, run with arrow right and cover with arrow up. And now lead the newborn turtle towards the ocean!Reach the ocean while avoiding the falling objects!Dive into adventure and fun with this cute baby turtle. The little one needs your help to escape the dangers of wildlife - and there are many!Much fun!Join now and have fun!